In the last part of this series, I explicitly stated my opinion that there is no place for a big hop presence in an Imperial Stout, citing Pipeworks’ Close Encounters as an example of a stout that was just too hoppy for me. A good beer, without a doubt, but in my mind it is way closer to a specialty beer than a RIS, solely because of the hops. This is my personal opinion showing, and even the 2015 BJCP Style Guidelines say that the hop flavor and aroma in an Imperial Stout can be high. I suggest trying a few examples and seeing what works for you! 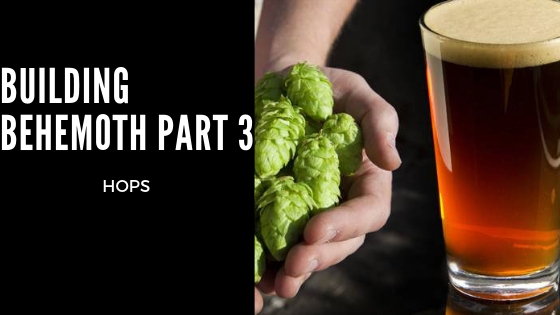 In this part of the series, we are going to take a look at the hops and hopping techniques used by the professional and award-winning brewers. We’re also going to examine the data from the Reddit RIS survey a bit more in-depth and take a look at some other professional sources. Before my previous statements get taken as “don’t use a lot of hops in a RIS”, let me say that we definitely need hops in an Imperial Stout. A lot of hops, relatively speaking. They provide the bitter balance to the Imperial Stout’s sweetness, and with such a high OG it takes a lot of hops to provide said balance. I like our Imperial Stout a lot, and it gets a little underappreciated in our portfolio with Breakfast Stout and KBS in there, but I find so many imperial stouts that are just out of balance. Either there’s way too much cloying sweetness or way too much burnt flavor or they’re over hopped. The key to ours, and it goes in line with my philosophy of brewing in general, is balance. It’s about getting all those extreme flavors in there but balancing them. Similarly, Eric Asebrook of Thirsty Dog says that the concept of an imperial stout is “balanced complexity”. I couldn’t agree more with both of those statements, and they call out the necessity for balance, which the hops help provide. But how do you know how many hops to use? Personally, I’m a big believer in IBU:OG ratios. They aren’t a hard and fast rule, but for a new recipe they are a great place to start. Taking a page out of Designing Great Beers by Ray Daniels, the average IBU/OG ratio for an Imperial Stout is .9. So, for example, let’s start with an Imperial Stout that has an OG of 1.100. So, in theory, a balanced Imperial Stout with an OG of 1.100 would need 90 IBUs. The point here is that we need hops, but in my opinion they should be balanced with the rest of the beer. The usual quick disclaimer, I hand-picked these examples because they are beers that I personally enjoy. That means any information here applies to my palate, and the beer I want to brew. If you like hop-forward aggressive stouts, you can easily do this research with examples you enjoy! Here is the hop schedule for each of the professional recipes that we utilized in the last part of the series. And here are the numbers from past NHC winning recipes, with the exception of 2013, which utilized homegrown hops and we can’t really know how many Alpha Acids are in the hops (we could ball park it, but who really knows). I find this information super interesting, and as usual the homebrewers don’t disappoint. Before we continue though, I want to point out that for ALL of these recipes, Alpha Acids are an approximation, and so these ratios almost certainly vary from their real life examples at least a little. The first thing that stands out to me is that each of the commercial examples has an IBU/OG ratio of either .9 or .8. So that necessity for balance is reinforced in these examples. I’m actually surprised by the lower ratio in Yeti, which I’ve usually found to be a bit more hop forward than something like Ten Fidy, but that may just be evidence that 30 minute and late additions help reinforce the hop profile. The homebrewers, on the other hand, are all over the board with a range from .45 – 1.28. Looking at this data, I feel into a trap, let fly an arrow, and then painted a really nice target around it. I wanted to say “Well, it looks like most of these are around .8” but really there is just too much variance here. It’s a beautiful thing, people are making great beer in a lot of different ways, and I love seeing the versatility that homebrewers have brought to the style. So when should we add our hops? And how many times should we add them? More often than not, I hear people advocate for two to three hop additions in a RIS, which is supported in the Reddit RIS Survey. The rationale is that most of these beers are going to improve with age, and with that aging perceived bitterness will decrease and hop aroma/flavor will rapidly fade. So you want a solid bitterness without worrying about the hop character. With that in mind, what we have above is a really interesting set of data. We have an average of 3 hop-time additions. Meaning, no matter how many hops are used, they are typically being added an average of 3 times. The chart below shows how often each addition was used, and the average IBU of said addition. If we are purely going off data, it looks like the “average” RIS would have a 60, 30, and 0 minute hop addition with 85 total calculated IBUs. These numbers are pretty interesting, but I want to emphasize again that like grains, hops additions are relevant within the context of their recipe. Meaning a 60, 30, and 0 minute hop schedule looks like a solid rule of thumb, but that doesn’t mean it is “better” somehow that the 75, 45, 30, 15, 5, 0 schedule. We have an average of 2.75 different varieties of hops used per recipe. Typically the 60 minute addition is a different hop than the rest of the additions, which tend to be similar (or the same). The chart below shows the most used hops, and when they are typically used. Number of uses is out of 42, the total number of individual hop additions in every recipe. I think this information is interesting, but it doesn’t mean much in isolation. Each of these hops were used with others, and there isn’t much consistency from recipe to recipe. Certainly nothing as clear as Chocolate/Roasted Barley grain split from the previous article. If you’re struggling with a RIS recipe, a good way to utilize this information would be to decide what sort of character you’re going for, deciding on a hop schedule, and then saying “Well, a lot of people used Centennial for bittering and the hop description is in line with what I want”. Always plan in the context of what you’re looking for, start with the product and work backwards. This chart is used to fill in those gaps. As far as my own personal hop selection goes, I love Magnum or Challenger for bittering and Fuggles for Flavor/Aroma. If anything, this data shows us that there is a lot of variance in hop selection so do whatever works for your system and recipe! Going with the “start with a product” model, I don’t like aggressive hop character. I think a great RIS needs to be balanced, with some low supporting hop flavor. Aroma isn’t important to me, and I plan on aging this beer, so any aroma would be diminished anyways. There is certainly an argument for adding aroma hops so that, even in incredibly small amounts, there is a layer to add complexity to aroma that helps bring out the malt profile. I’m in full support of this, and I definitely want to experiment with it, but it just isn’t for me. Really, there isn’t too much experimentation that I’m seeing here. I’ll openly admit I’m less concerned about the ways hops play a role, which is a limitation in my brewing. Bitter the beer for balance, a little flavor, and I’m happy. Is there a difference between a beer with a 0 minute addition RIS and a RIS without a 0 minute addition fresh? After 3 months? 6? And which do I prefer? Is there a difference in a beer bittered with Magnum versus Challenger? Which IBU/OG ratio do I prefer? The next part of this series will focus on yeast and yeast selection! I will also cover fermentation in this section, since the two are so related, and then I’ll reference back to fermentation in later articles.